Two new articles by John Lantos address ethical issues, one is explicitly about the NICU, the other is relevant to our issues, but uses an older child case as the example. The article in the FPNEJM is 8 pages long plus 2 pages of references, rarely seen in that journal! Lantos JD. Ethical Problems in Decision Making in the Neonatal ICU. NEJM 2018;379(19):1851-60. The central argument of this review is that an important and necessary shift is occurring in the focus of neonatal bioethics. The focus used to be on empowering parents by giving them information and on rule making to define the zone of parental discretion. Today, the focus is shifting toward an ethics of relational autonomy. Doctors need to develop new communication skills to help parents clarify their values. Doctors must also be aware of their own values as they design the choice architecture within which parents will be empowered to make choices. This self-awareness and these communication skills will be especially important as pediatrics changes and decisions become even more complex and value-laden. He presents the following schema, which includes and expands on ideas and empirical research from several sources, including Annie Janvier, Antoine Payot and Nathalie Gauthier from our hospital, Marlyse Haward from Albert Einstein College of Medicine, several parents, including Barbara Farlow and Jason Baardsness, the POST group of neonatology professionals who have also been NICU parents, and of course, from John Lantos himself. 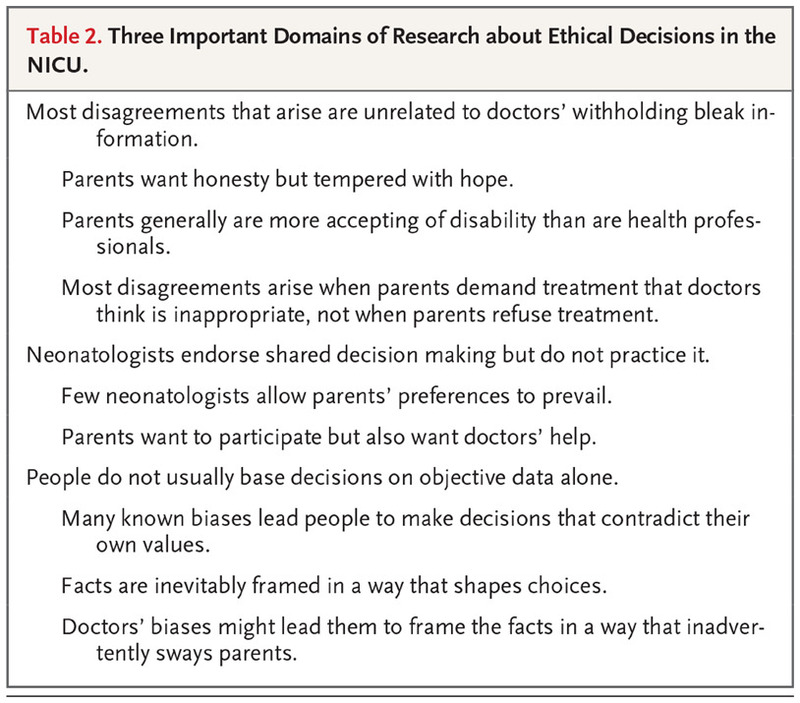 John Lantos also points out some relatively recent research that points out the limitations with the current paradigms of ethical decision making in the NICU, which he tabulates as shown below. If you can get access to the full text it is worth the half an hour of your time that an initial read will take, and then several hours of thoughtful reflection. Also very much worth the read is an article with the thought-provoking title “Tell Parents the Truth, but Tell It Slant” Lantos JD. Pediatrics. 2018;142(Suppl 3):S199-S204 (appears to be open access). Which might suggest at first that he is suggesting that we should bend the truth when talking with parents about difficult decisions. However, in reality he is quoting is from a poem of Emily Dickinson, and he is making a case for ambiguity, for gently revealing the truth when things are not going well, for humility. He notes that discussions about redirecting active intensive care to comfort care often incorporate a formal request to write a DNR order, but that we do not request a “Do Not Dialyze” order or a “Do Not ECMO” order. 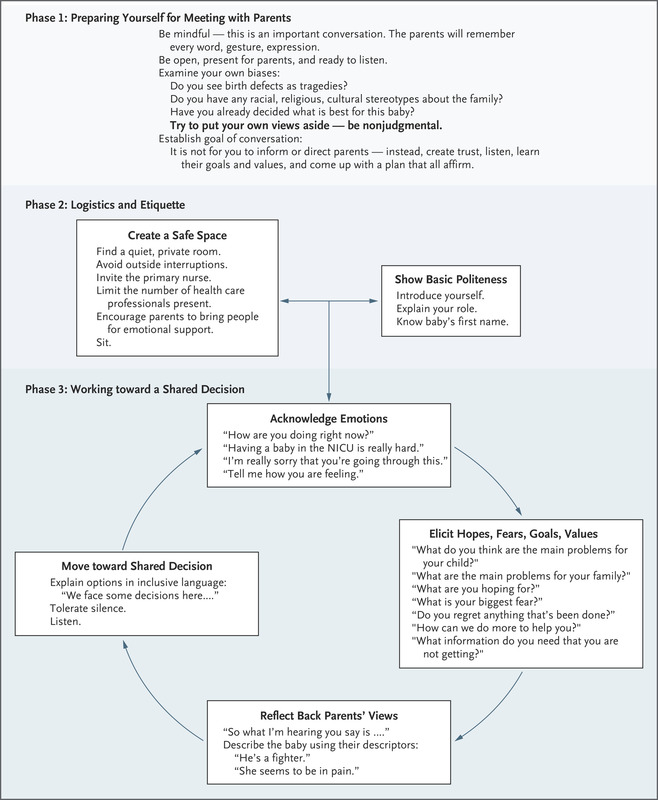 That our discussions should incorporate more listening, and more attempts to understand the values and preferences of the family, “to respect those values and honor those preferences, doctors need to listen carefully to understand what parents are saying, what they are not saying, what they mean, and what they need. Sometimes they may be saying that there are things that they prefer not to discuss or decisions that they prefer not to affirm”. Who can hear that their child is dying and not react against it? Who can say “no thanks” when given an option of cardiac massage for their critically ill infant? We do violence to the families of our patients to offer them extreme measures which will not work. Rather than demanding explicit agreement to limit or withdraw care, we can often gradually, with explanation kind, let the truth gradually become dazzlingly clear. Keith, your last line is poetry itself. Lovely blog.